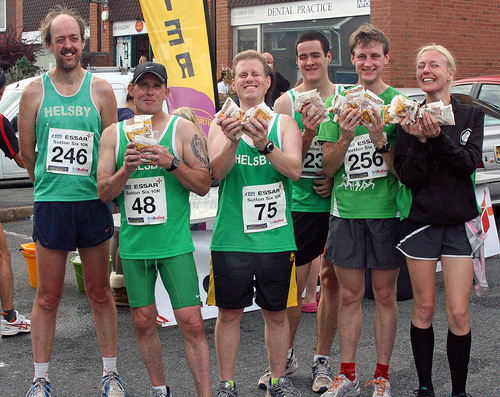 Once again, as summer slowly wans into autumn, it’s been a busy week for Helsby running personnel. Last Tuesday saw Race 2 in the September Wirral Multi-terrain series. Full results and current placing’s are on Steve Saunders website here www.stevesaunders.co.uk Helsby position and times below, with a special congratulations to Adrian for breaking into the top 100 for the first time, something he’s been aiming to do since last year, great effort. Sterling effort by Carol for a 2nd place in her category and Jayne and Jackie both 3rd in theirs. 15 of us ran in total. Team placings can also be seen on the full results pdf document. Mixed bag of weather on the night, and what could have been a golden beach sunset turned into a windy and heavy shower for the 2nd lap of the beach run. Still great fun for everyone I’m sure! Race distance was 4.9miles with road to begin then beach and the Wirral Way to finish. Another beach run this Tuesday as race 3 is at Harrison Drive, Wallasey at the earlier time of 6.30pm. Hopefully we can still have a good crowd out, and remember there’s no registration, just turn up in the Helsby vest and run. You’ll need a pound though but not a bad price for a race. Results now out as above but Andy Robinsons time is down as 20 mins slower than he actually was, so I’ll send a separate email when they arrive but four of us out from Helsby and all having a brilliant day, great weather and great scenery and to be honest really quite spoiled at the end with endless tea being offered. It is definitely one for the calendar to try if you have not had a go at this type of event even if you don’t feel like racing. Good to see Ian Hilditch out on the course too. Adair, Ian Landucci, Andy Robinson and Jackie all ran. Oats all round! Has Andy already had his……….? Hope I’ve not missed anything. I’ll be heading to the club at 5.30pm this Wednesday for a faster hill run if anyone fancies it to try and utilise a bit of the light while its remaining. I’ll also send a reminder out later in the week about our next club fell counter this Saturday which is also the final race in our Inter-club series. If you’ve not tried a hill/fell race yet definitely one to try.